Dalton Street | Eltham District Historical Society Inc.
Eltham District Historical Society Inc.
#ThrowbackThursday – Today we time travel back 90 years to Saturday, October 13th, 1928. We have been invited to attend the official opening of the new higher elementary school building at Eltham along with about 1,000 parents and children. The school was originally opened on January 26, 1926 with 60 pupils and Mr. John Stewart as headmaster. Classes were initially held in the State School building in Dalton Street and the public hall in Henry Street. Apart from guaranteeing sufficient pupils, the Education department also required the local residents provide an area of land of eight to ten acres and a cash guarantee of £1,200 though this was ultimately reduced to £600 given the land was purchased at £90 per acre. It has taken nearly three years of hard work by the community to achieve this aim but finally the big day has arrived, 12 months after tenders were first advertised, which cost £5,000. The day is cast in glorious sunshine. With a pleasant breeze and a maximum of 58 (15° C), Eltham is looking its best. There is an air of gaiety and excitement about. Unfortunately, those visitors who have arrived by train are somewhat unimpressed with the railway station surroundings. On the vacant allotment right alongside the station is an assortment of rusty kerosene tins-about 15 of them-and the fences adjoining are in a thoroughly disgraceful and disreputable state, and have been for some months. In addition, several of the trees at the approach to the railway have died for want of attention, and hoodlums-said to be of local extraction-have deliberately destroyed several of the barrels enclosing the trees. Not so long ago the nearby swings were also vandalised and what was left of them were removed by an indignant resident. However, as we approach the school grounds, beautiful hedges of hawthorn in full bloom greet us before entering the gates. Just inside the grounds are row after row of quince trees, between the leaves on the branches the fruit beginning to show. No doubt a tasty treat will soon be provided for the boys and girls during breaks in the day. Dotted about the school ground are small picnic parties enjoying life in the beautiful sunshine to the fullest extent. The sound of music supplied by a section of the Returned Soldiers’ Band from Anzac House. In the marquee there are small tables dotted about with groups of people sitting around them. The tables are decorated with posies of early Victorian period made with forget-me-nots, daisies, picotees, heavenly blue, stock and wallflowers. The posies are the handiwork of Mrs. H. Rutter, wife of the president of the Eltham Shire, and the sweet-smelling blooms come from the beautiful garden at “Yarra Brae,” Eltham, the home of Cr. and Mrs. Rutter. They are greatly admired and sought after. As we cast our eyes further around the scene we see a group of children chatting with Mrs. Hooley (nee Miss Sweeney), a former teacher at the State School in Dalton Street. In the lead up to today’s carnival, a number of people have been struck down with the flu, including various committee members; Mr. John Stewart, the headmaster, amongst them. Fortunately the good weather has invigorated him sufficiently well enough to join us but disappointingly, the Governor of Victoria, Lord Somers, who was intended to perform the opening ceremony has also been laid low and forbidden to leave Government House. In place of His Excellency, we learn that Sir William Irvine, Lieutenant-Governor and a fellow local Eltham resident has agreed to step in. We also hear word that Cr. H. Rutter, president of the shire, was called away unexpectedly to England earlier in the week to fulfill an important business engagement in connection with the firm with which he is associated. The acting president, Cr. A. H. Price, will stand in to represent him. An interesting little ceremony is now taking place near the flag pole. Mr. Stewart is announcing that Mrs. George Phillips, of Eltham, has presented an Australian flag to the school. The gift, remarks Mr. Stewart, is a most acceptable one, and it is a kindly and generous act. Mr Stewart requests Mrs. Phillips unfurl the flag and cheers arise from the onlookers as the new flag flutters bravely in the breeze at the top of the pole. A sports carnival has also commenced for the boys and girls prior to the arrival of Sir William Irvine. It is scheduled to run throughout the afternoon, interspersed among other activities. Punctual to time, Sir William Irvine arrives and is greeted with cheers as he, in company with Mr. J. Lemmon (Minister of Education), Mr. W. H. Everard, M.L.A., and Mr. C. Hansen (Director of Education) take up their positions at the entrance doors of the school whilst the band plays the National Anthem. Also present are Mr. H. G. Fryer (president of the Teachers Union), and Councillor A. H. Price (representing the Eltham Shire Council). Upon completion of the National Anthem, Mr. Stewart apologises for the absence of Cr. Rutter but states it has afforded him the pleasure of welcoming Sir William Irvine, who had so kindly assented, at very short notice, to take the place of Lord Somers, and whose presence at the gathering had been looked forward to by residents of Eltham. Mr. Stewart says he believes Sir William Irvine would ably fill the gap caused by the absence of Lord Somers, which is met with applause by those standing around us. Mr. Lemmon, is next to speak and he too is received with cheers. He also thanks Sir William Irvine, who has come at such short notice to take the place of His Excellency, Lord Somers, and whose inability to attend is greatly regretted. He expresses hope on behalf of all of us in attendance that the illness of the Governor would be of short duration; to which several people call out “Hear, Hear!” Mr. Lemmon expresses his own pleasure to be present in order to take part in the opening celebrations connected with the Eltham Higher Elementary School. He is pleased to see that the representative for the district, Mr. W. H. Everard, is out and about again, which is also greeted by the crowd with a “Hear, hear!” He states that Mr. Everard has well and faithfully represented our electorate for the best part of a decade, and was a man who looked well after the interests of the people whom he represented. More applause follows. He continues to state Eltham is one of 48 similar schools scattered throughout the State in addition to 38 high schools. We are told that only 25 years ago pupils received no more than an elementary education at the hands of the State, whereas today students to the number of 13,000 are catered for in the higher elementary and high schools. The cost of education had increased during that period from £750,000 annually to £3,000,000. Mr Lemmon says that the amount might seem large, but in his opinion, it is money well spent. Mr Lemmon then congratulates the school committee on the excellent work it has done, and he trusts that parents will also take an active interest in the school and those who attend, allowing the latter to remain in school after they have attained the age of wage-earners. He recalls he has often heard the glories of Eltham spoken of, and from what he has seen of the place today, the encomiums passed thereon are well justified and deserved. This is met with much applause. Mr Lemmon continues with a reference to one of the greatest men who had ever given his services to the empire, the late Lord Haldane, who had said that the purpose of education was to develop an appreciation of culture for culture’s sake, and also to further the application of science to industry. He reminds us that Lord Haldane had further said that a democracy which failed to provide equality of educational opportunity, was not a real democracy at all. Mr. Lemmon concludes his remarks saying it is the wish and desire of those entrusted with the education of our boys and girls in Victoria to carry out those fundamental principles which had been advocated by Lord Haldane, who had been one of the greatest educationalists the world had ever possessed. Sir William Irvine now steps forward and addresses the gathering. “Fellow citizens of Eltham,” he starts with. Even though he regrets very much the cause for him being among us this afternoon, he feels a distinct honour to be called upon to open one of the higher elementary schools in this State. He says he is an enthusiast in all matters pertaining to education, and in his opinion it did not matter if the cost of education was increasing, as he feels quite sure that the return would be well worth it. The more chances given to the rising generation in the way of education, says Sir William, the better for all concerned. The community will undoubtedly benefit thereby in the long run. Let the children be well equipped for a calling in life, and it would be well for all concerned. The new school at Eltham opens the door to higher education, and it is a door open to rich and poor alike. No matter how much people might disagree so far as political issues are concerned, they could all agree on the point that young people should be given every available opportunity to rise to greater intellectual levels. He continues in saying there need be no cause for apprehension, even if the cost of education rose to an even greater extent-than the figures which have been quoted this afternoon. It was the aim of education to bring the minds of people into paths of thought leading to vistas of intellectual truth and beauty. Secondary education should be a means of drawing out the creative intellect of the youth of this fair country, in order that their efforts would lead towards the benefit of all, so that their minds might be uplifted above the sordid cares of ordinary life, and so that they might enjoy the priceless heritage of English history. By possessing courage, energy and determination there was no goal which might not be reached. Sir William then declares, with great pleasure indeed, the Higher Elementary School at Eltham opened to resounding cheers. Mr. Lemmon calls for three cheers for the new school, which are heartily given, mostly from the lusty throats of youthful Elthamites and boys and girls from adjacent towns. Mr. Everard, M.L.A., expresses pleasure at being present at the afternoon’s function-the first official function he has been able to attend for 10 weeks. He desires to thank the good people of Eltham and throughout the other parts of the electorate of Evelyn for their kindly thoughts of him and the many inquiries made during his time of sickness and trouble. The kindly feelings and thoughtfulness of the people are greatly appreciated by him. He is also pleased to see present among others, Mr. Hansen, the Director of Education and Mrs. Hansen. He states it is necessary for men to have their wives with them “sometimes,” in order to look after them, which is met with laughter. Whilst regretting the unexpected and the regretted absence of Lord Somers, he says it is gratifying to have in our midst such a man as Sir William Irvine, who had responded to the call at short notice. Someone in the crowd calls out for a singing of “For He’s a Jolly Good Fellow,” when reference is made to the Lieutenant-Governor, but the response is somewhat disappointing, the popular air being started in different keys in various parts of the crowd resulting in discord. At the conclusion of these proceedings the party undertakes a tour of inspection of the class-rooms, afternoon tea following in a marquee. Groups of four are allotted to each table, and home delicacies in the shape of scones, sandwiches and cakes are partaken of under the chairmanship of Mr. Stewart. Mr. Hansen says he thought the time an opportune one on which occasion might be taken to return thanks to all those who had worked so hard in order to make the opening the success it undoubtedly is. The attendance of such a large crowd shows that the people are taking an interest in their new school. He says we have an ideal foundation for a complete plan of a new building, which he trusts would eventually develop into a high school. The school has a fine body of teachers capable of imparting the necessary instruction to the boys and girls who attend the school. Mr Hansen continues by saying when he first saw the site on which the school was to be erected, he expressed the opinion that it was one of the beauty spots of Eltham, and he was of the same opinion still. Mr. Hansen explains that the school building, designed with a Moorish style architecture is the only one of its kind in the State. Eighty children are at present attending the school and it has accommodation for more than 100 pupils. Mr Hansen also thanks the ladies of Eltham, particularly for the energetic and valuable part they had taken in connection with the school opening, and he moves accordingly. Mr. Everard seconds the vote of thanks, which is carried with much acclamation. Mr. Stewart makes a suitable response on behalf of the ladies, who had worked hard from the inception of the movement right up to today. He notes Mrs. Phillips and Mrs. Burgoyne were “the chief conspirators,” which is greeted with laughter. He adds that these ladies had been assisted very ably and capably by an efficient band of workers, who left no stone unturned in order to ensure today’s success. Lady Irvine, wife of the Lieutenant-Governor, also presents two beautiful pictures for hanging on the walls of the Higher Elementary School, in connection with the opening proceedings. One represents a Dutch girl and the other is entitled “Mother and Child.” Lady Irvine takes a keen interest in matters connected with the school. The gift of the pictures is greatly appreciated by Mr. Stewart and all those interested in the progress of the scholastic establishment. As a finale to the day’s celebrations an enjoyable dance is to be held in the public hall in Henry Street later in the evening. The entertainment has been organised by the united efforts of district social and sporting clubs working in co-operation with the school committee. Decorations in streamers representing school colors brighten the interior of the hall, and greenery has been artistically used to tone down the brighter colors. Smart and Aumont’s orchestra (violin, piano and mandolin) are to supply the music and Mr. J. Glen will officiate in his usual capable manner as M.C.. Supper will be provided later, and the entertainment will wind up at midnight. Should be lots of fun. Are you going to join us there? #ThrowbackThursday – Today we time travel back to school, Eltham State School No. 209 on Dalton Street, more commonly known today as Eltham Primary. It is 1891 and the children of Grades 3 & 4 and Grade 5 are lined up on this special occasion to have their photographs taken. It is a clunky affair taking a photograph back then. The photographer has to set up his big polished wooden box on to a tripod usually made of wood and brass. He has a large black cape which he covers the rear of the box. He pops his head under the cape to peer through the lens at the front of the box. Everything he sees is upside down. He fusses around to get the children lined up in the right spots, checks his composition once more, places the lens cover back on and then inserts a cassette containing the glass plate negative into the rear of the box. Upon commanding everyone’s attention one more time, reminding them to remain perfectly still till he says they can move again, he removes the lens cap and counts; 1, 2, 3, 4, ……. No one knows how it will turn out until he has processed it that night, but he knows; it is perfect. And the children will be able to share something very special with their fathers by the weekend. But shush now, that’s a surprise. 3rd and 4th Grade, Eltham State School No. 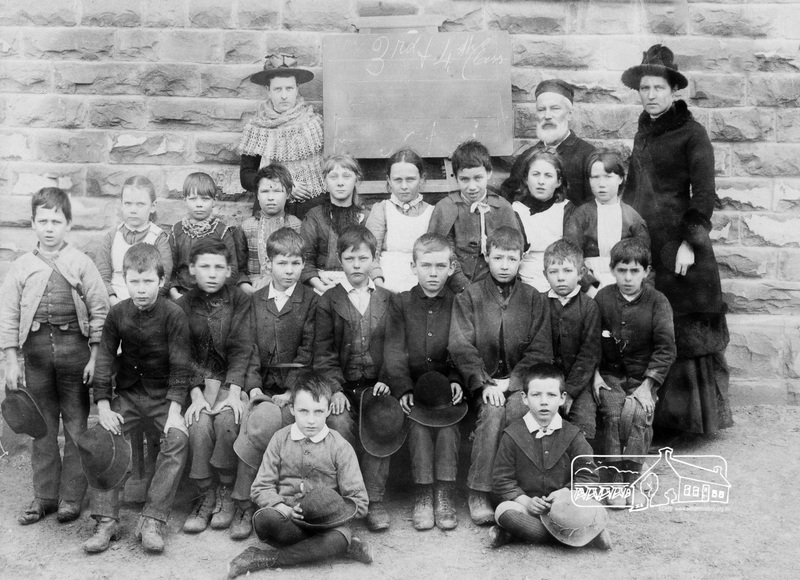 209, Headmaster David Clark and assistant teachers, c.1891. Bottom seated row, right side end, Alex and Alfred (Tommy) Smart. 5th Grade, Eltham State School No. 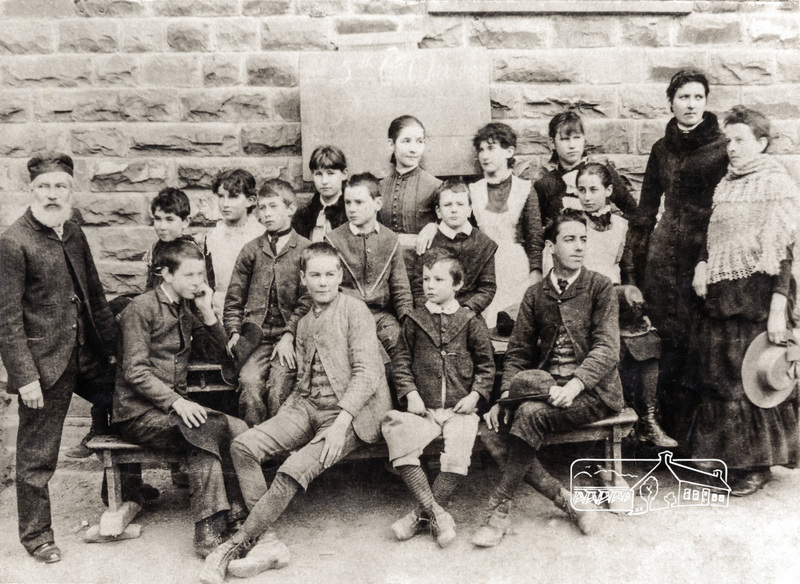 209, Headmaster David Clark and assistant teachers, c.1891. 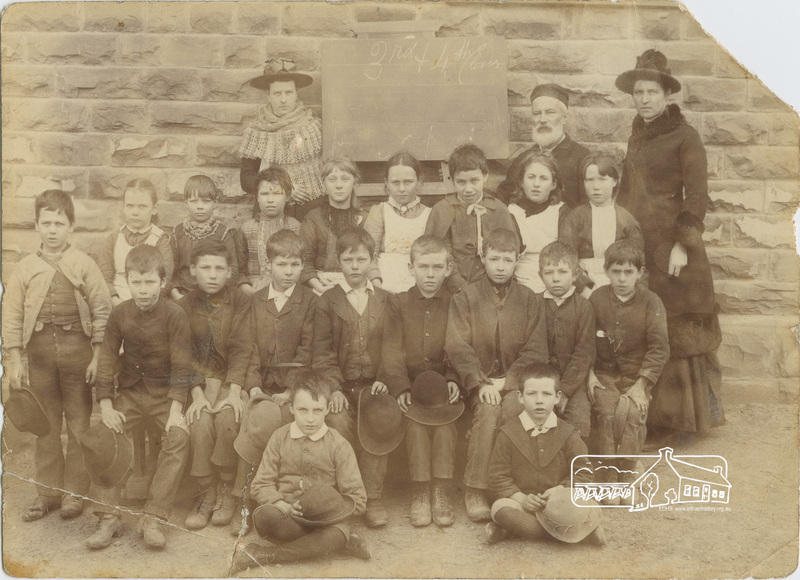 The children of Grades 3, 4 and 5 in 1891 want to wish all their father’s a very special day this weekend but also all of the fathers that have come after them a very special Happy Father’s Day this weekend also. Father’s Day did not actually exist in 1891. It was initially founded in the United States in Spokane, Washington at the YMCA in 1910 by Sonora Smart Dodd, who was born in Arkansas. Its first celebration was in the Spokane YMCA on June 19, 1910. Her father, a Civil War veteran, William Jackson Smart, was a single parent who raised his six children there. We wonder if William Jackson Smart was in any way connected to the Smart family children attending Eltham State School in 1891. 3rd and 4th Grade, Eltham State School No. 209, c.1891. The original postcard photograph was donated to the Society by May Smart, who was a student at Eltham State School 1915-1923. May was the daughter of Alex Smart, 2nd from the right in the seated row. His brother Alfred (Tommy) Smart seated at the end of the row on his immediate left. Restructure of Local Government in Victoria – Principles and Program’ (the Morris review). 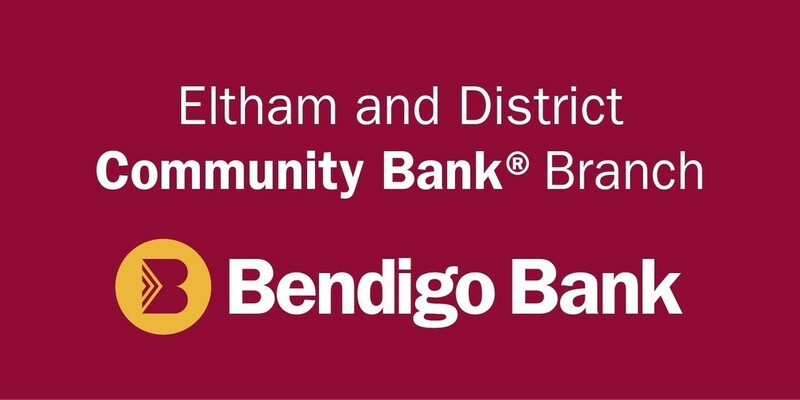 The recommendation was to amalgamate the Shires of Eltham and Diamond Valley, something that Eltham Council did not support as being appropriate for the shire or compatible with the ‘Spirit of Eltham’. The video features Shire President, Cr. Mary Grant talking with the Hon. Pauline Toner MP and Max McDonald MP. Eltham Shire CEO Rodney Roschellor presents an alternate proposal for a shire merging more aligned to the ‘Spirit of Eltham’.Also featured are Eltham icons such as the Eltham Railway Trestle Bridge, Montsalvat, Eltham Community Centre along with mudbrick making, artist Matcham Skipper, the Green Wedge and St Andrews Market. Other commentary is provided by locals Judy Wadham and Lester Eaton. This video is of the opening of the new Eltham Library on May 22nd, 1994. It features an introductory look at the new library with the assembled guests with music performed by Eltham High School. A welcome speech is given by Shire President, Cr Pamela Sladden followed by the Hon. Peter Staples, Member for Jagga Jagga. Cr. Robert J. (Bob) Manuell, Chairperson, Eltham Library Redevelopment Special Committee then gives a sometimes humourous analogy of the history of the project’s development from conception to delivery with reference to the Year of the International Family (1994). At the end of the speeches there are scenes of guests looking over the library followed by scenes of the Shire President’s picnic.